A total of 43 suspected Rollin' 20s gang members are now arrested after two turned themselves in to police, the Jacksonville Sheriff's Office said Wednesday. RELATED: Gangs on the First Coast | Who are the Rollin' 20s and what are Bloods? 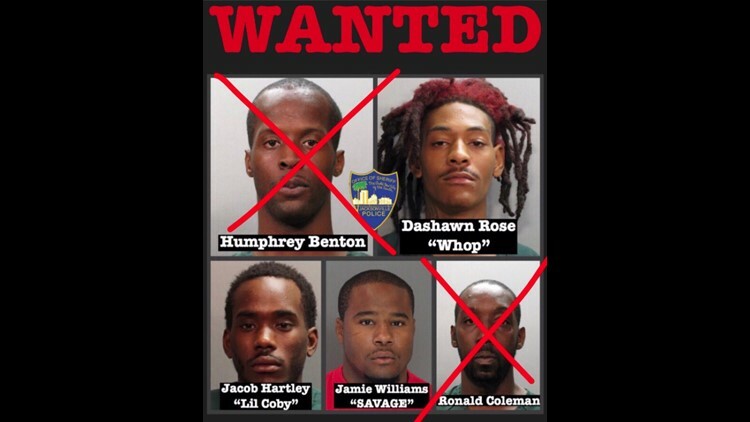 Humphrey Benton and Ronald Coleman were the individuals that turned themselves in, JSO reported. The Sheriff's office posted this image to Twitter Wednesday. In a press conference last Friday, Jacksonville Sheriff Mike Williams said a total of 41 suspected gang members from a multi-state gang called the Rollin' 20s were arrested in Jacksonville following a two-phase investigation, and 5 others were still at large.